Recently, The Michigan Daily did an interview with John Krasinski, the director, co-writer and star of A Quiet Place. Krasinski first came into the public eye for his starring role as Jim Halpert on the American version of The Office, and it has been captivating to watch him branch out into more dramatic territory in the years since the show ended. 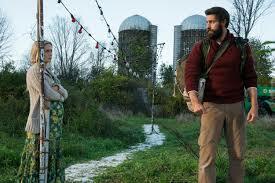 In the interview, he talked about his goals for A Quiet Place, and the conscious decisions he had to make regarding sound and music, since the characters in the movie can’t make a sound without being attacked by violent creatures. As someone who loves the horror genre, I’m incredibly excited to see the approach that this new film will take, and how it will use the lack of sound as an advantage rather than a detriment. It should also be interesting to see how the real-life chemistry between Krasinski and Emily Blunt (Sicario), his co-star and wife, plays into the movie and translates onto the big screen. A Quiet Place is currently showing at various theaters around Ann Arbor, including Rave Cinemas, Emagine Saline and the Quality 16.